We warmly welcome you to ‘The Castle House’ Boutique Bed & Breakfast in Richmond, North Yorkshire. 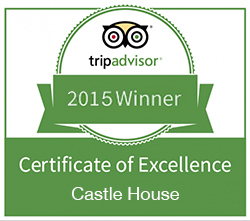 Situated in the shadow of the famous castle, overlooking the historic town square of Richmond we are positioned in one of the most stunning parts of Richmond and the North Yorkshire Dales. 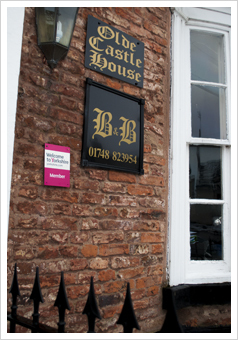 The Bed & Breakfast has recently been lovingly renovated extensively by Gordon & Sue Maughan the previous owners. Maintaining the houses’ original features whilst instilling an essence of boutique Bed and Breakfast luxury, comfort and affordability. 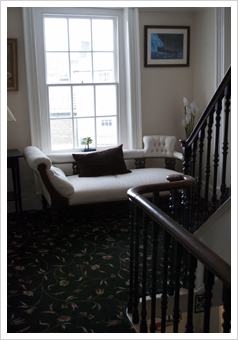 Having just completed some further refurbishments to this beautiful 18th century town house we can ensure that all our guests feel pampered whether you are taking a few days away from your busy life, on the Coast to Coast walk through the North Yorkshire Dales or on business in the North East . We like to pride ourselves in taking time to look after all our visitors that want to enjoy the beautiful gateway to the North Yorkshire Dales, with exceptional panoramic views in this historical and quiet part of the town of Richmond. The Bed & Breakfast lends itself to the perfect position for those wishing to flavour Richmond and the North Yorkshire countryside at its best, even if it is for a very brief period. Situated just off the main market place of the historic town of Richmond, there is no better place that is located within just a stone’s throw to the centre (1 minute walk) that is quiet, yet within easy reach of all amenities such as restaurants, public houses, book shops, banks, bakeries etc etc. Each bespoke room has en-suite facilities, free Wi-Fi, flat screen televisions with free view, bathrobes, hairdryers, and tea and coffee making facilities to make your stay as relaxing and comfortable as possible. All guests are welcomed with a complimentary glass of wine, or tea/coffee on arrival and at night complimentary chocolates are left for you. Most importantly, you are welcomed in the morning for breakfast where you can choose from cereals and fresh fruit followed by a traditional English breakfast or smoked salmon & scrambled egg. All guests have use of the communal dining & sitting room, where there is a small library of books and information on local attractions in the North Yorshire Dales and in Richmond. We have both come from very different working backgrounds and spent a number of years travelling around the country staying in bed & breakfasts. It has, for a long time, been our dream to set up and run a guest house that we would ourselves enjoy staying in, bringing what we feel are the ‘important’ attributes together to encompass a place to remember, enjoy and feel pampered. Now that 4 of our 5 children have fled the nest leaving us (and *Millie our beloved Golden Retriever, aged 11), we feel incredibly lucky to have found such a gem in one of the most beautiful parts of North Yorkshire & are now able to fulfil our dreams. 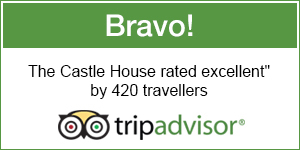 We hope that you enjoy your stay with us. Please do let us know if there is anything we can do to make it all the more special. The market town of Richmond - from the Norman French 'riche-monte' meaning 'strong hill' - has grown up around the Norman Castle which still dominates the town today. The building of the castle as a military stronghold commenced in 1071 on land gifted to Alan Rufus (the Red) of Brittany by his kinsman William the Conqueror as reward for his part in the victory over King Harold, and his subsequent support of William as one of his most trusted advisers. Richmond, North Yorkshire was the first town to be called Richmond. It is the Mother of All Richmonds. Important growth in wealth led to Richmond becoming a chartered borough. It had 13 craft guilds (which controlled trade.) It had important markets and fairs. 1311 Defensive stone walls built to protect the town from Scottish raids. Two postern gates in the town wall still survive; The Bar postern at the top of Cornforth - Hill and in Friars Wynd the other Postern gate remains. The Market Place A large area, was originally the outer bailey of the castle. At this time once stood The Stocks and Pillory, for punishing wrongdoers. Also the market cross was a feature in the market. It was a place to gather and a position for selling Butter and Cheese. 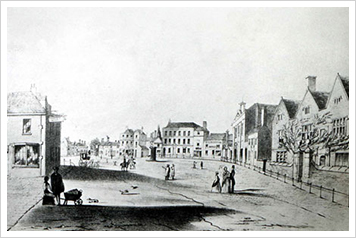 The Market Cross was replaced by the present Obelisk. The Bubonic Plagues -14th and 15th Centuries Richmond and Swaledale had a series of very wet weather during these years, resulting poor harvests. Cattle and Sheep developed disease which led to the population in 1349 being devastated with Bubonic Plague. Lesser epidemics occurred for the next 100 years. A cemetery at Easby Church has a plague stone. This deadly disease wiped out many of the inhabitants and affected the trade and farming industry. Important religious House of the Greyfriars (now only the Bell Tower remains) and the premonstratensian - order of The White Canons at Easby Abbey. A small chapel dedicated to St. James of Compestella existed in what is now St. James Chapel Wynd, which leads from the Green to Bargate.